Relax in bright, spacious rooms with private balconies. Enjoy 27 holes of championship golf. The Sea Palms Resort guest rooms are currently unavailable as they are undergoing a complete renovation due to the damages caused by Hurricane Irma. Please check back for details on when we expect to reopen. The Public House restaurant, the golf course, and conference center are all open for business. Please check for availability at The Sea Gate Inn or Ocean Lodge, two boutique hotels located on the south end of the island. Uniquely situated along the tranquil salt marshes of St. Simons Island, we invite you to experience the new Sea Palms Resort. After completion of a multi-million dollar renovation, the resort is proud to unveil several upgrades and enhancements that will convince you to return again and again. Our enhancements are diverse and comprehensive. Guest Rooms have been refreshed with a new bedding package, 42" flat screen televisions and spacious balconies. The George Cobb-designed golf course features rebuilt bunkers, reseeded tifeagle greens and Bermuda fairways. The Conference Center building has been equipped with an intimate guest registration area. The pool has been outfitted with cabanas and an outdoor fireplace and a new fitness room has been added. The extensive Conference Center redesign included all meeting rooms; changes in lighting, carpet, AV and connectivity and new meeting rooms now totaling 10,000 square feet. Be sure to try our new restaurant and lounge, The Public House at Sea Palms Resort. Guests now enjoy parking and beach access at the popular East Beach, which is located five miles from the resort. Since 1993, the St. Simons Trolley Company has conducted the original and definitive tour of St. Simons Island. Ranked #2 by Huffington Post as the best thing to do on St. Simons Island, Lighthouse Trolleys is the only company that can offer up such a diversity of services, tours, and memory moments both by land and sea. Built in 1736 by James Oglethorpe, Christ Church Frederica is one of the oldest churches in the United States, and is the first site of English-speaking, religious services on the island. Steeped in history and a harbor for soldiers during the Civil War, this gorgeous Gothic-style church is surrounded by ancient oaks and a centuries-old cemetery. Protected by the National Park Service, this monument represents the remnants of the fort that played an integral part in the British forces’ defeat of the Spanish in 1742, confirming Georgia as a British territory. The site stands on the Atlantic coast, surrounded by more trees today than during its colonial days. Originally built in 1810 and later destroyed during the Civil War, the current Saint Simons Island Lighthouse was reconstructed in 1872 by order of the United States Government. Home to several lighthouse keepers and their families from its beginning until 1950, the lighthouse is still used by the US Coast Guard as a beacon for traveling ships today. 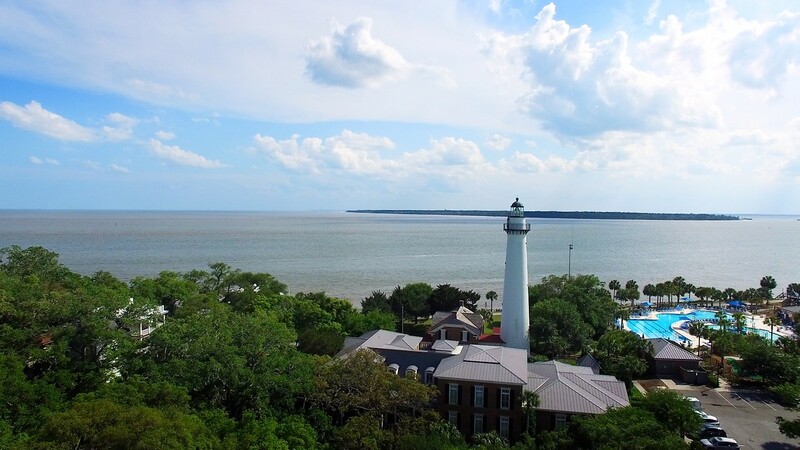 Walk the 124 steps to the top of the tower, witness the gorgeous view from the top, tour the beautiful Victorian-era lighthouse keeper's home, shop the museum, and experience living history tours of this national treasure when you visit St. Simons Island. Opened in 2009 and located next to the St. Simons Island Lighthouse, this sunny park is filled with a sparkling blue swimming pool, a free state-of-the-art playground and a brand-new mini golf course. Learn all about Sea Turtles – their nesting habits, their struggle to reproduce and the need for their protection – through group tours, educational programs, and fun special events at the Georgia Sea Turtle Center. An unforgettable experience awaits you and your family here. Located 30 minutes away from Sea Palms Resort on Jekyll Island, Summer Waves Water Park offers "splashtacular" summer fun for the whole family! Enjoy exhilarating experiences, including frolicking in the Frantic Atlantic Wave Pool, getting gleefully dunked at the Splash Zone, or riding the thrilling, five-story water slide, Pirate's Passage. You can also take it easy as you tube gently down Turtle Creek or relax while your little ones play in the Kiddie Pool. Another one of the Golden Isles, this small barrier island is privately owned, and is only accessible by boat. Most of it is covered by salt marsh. Island Time Charters offers year round fishing charters perfect for the beginner and advanced angler. Kids are always welcome! Choose from a four hour inshore trip, six hour nearshore trip or an eight hour offshore trip. Your personalized trip will include gas, bait, tackle, water, and snacks. Captain Blackshear will also clean and package your fish to take home and enjoy! St. Simons Island features two public beaches. The Massingale Park Beach is the most popular, with a picnic area, bathhouse, and even an on-duty lifeguard from June 1st until Labor Day. Parking and fishing are both free at Massingale, and drinking is allowed. The second beach on St. Simons Island is the Coast Guard Station Beach, which also has a bathhouse and showers, as well as on-duty lifeguards and permitted drinking. Animals are prohibited on the beach from 9 a.m. to 5 p.m., Memorial Day through Labor Day from Mallery St. (the pier) to First St./East Beach (Coast Guard Station). Please use the beach trash receptacle or carry your trash off the beach to a dumpster. If your animal leaves more than prints in the sand, please pick it up and dispose of it in a trash receptacle. The restaurant offers a range of craft beers and a carefully selected range of tap and bottled wines from around the world, all to compliment a unique dining setting which incorporates seating in the bar, or in an intimate restaurant. Join us Monday through Friday from 4:00 – 7:00 p.m. for the best Happy Hour on St. Simons Island. Specials include $3 domestic drafts, $4 house wine, and $5 well drinks. The Tiki Bar is available at the Sea Palms Clubhouse Pool for all of our members and guests to enjoy a variety of snacks and beverages at the pool with the family. Soak up some sun and grab your favorite cocktail! Family visiting for the Christmas holiday? Join the Sea Palms Family for Christmas Eve at our annual buffet! | Call 912.434.5340 or email jamie@seapalms.com | Seating times: 3:30pm, 4pm, 5:30pm, 6pm | $45 per adult | $22 per child | Prices do not include tax and gratuity.